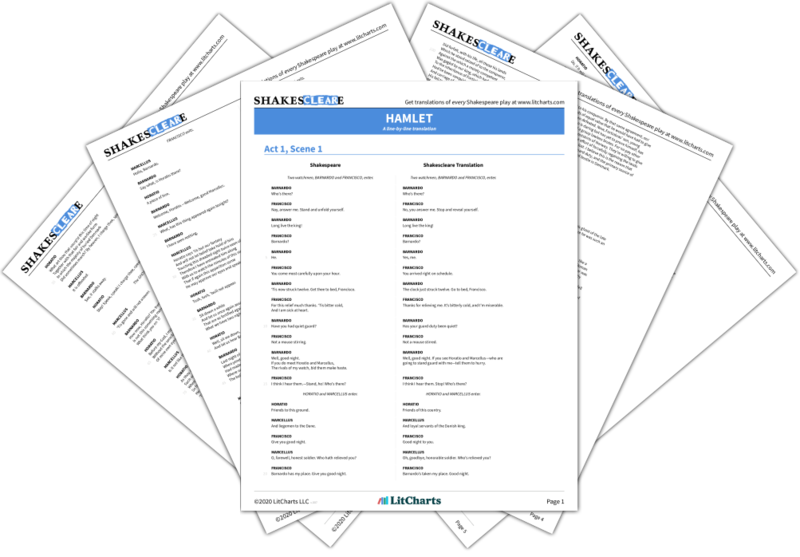 Instant downloads of all 942 LitChart PDFs (including Hamlet). Claudius mulls how to deal with Hamlet. The killing of Polonius has convinced him that Hamlet is too dangerous to remain nearby, but at the same time he is unsure how to send Hamlet away because the people of Denmark love Hamlet. Claudius is always thinking about politics, about appearances. Rosencrantz and Guildenstern enter with Hamlet. Claudius asks where Polonius is. Hamlet answers that Polonius is feeding worms. He explains that a dead king will do the same and, through the processes of nature, might end up in the "guts of a beggar." Hamlet then says Claudius could send someone to check for Polonius in heaven or go down to check in hell himself. Finally, Hamlet tells them that in a month they may smell Polonius's body rotting beneath the stairs to the castle lobby. Hamlet's mockery and word play begins to focus on death. He describes how life devours itself in order to live, and explicitly links this idea to the image of worms devouring a king. In doing so, Hamlet is indirectly threatening Claudius. Claudius sends Rosencrantz to get the body, then tells Hamlet that to protect him he will send him immediately to England. Hamlet agrees, though he continues to insult Claudius. Claudius sends Guildenstern to make sure Hamlet gets on the ship immediately. Finally alone, Claudius writes a letter for the three men to give to the King of England—a letter that asks the King to execute Hamlet. Claudius doesn't feel the need for evidence to act against Hamlet. As soon as Hamlet seems like a threat, Claudius plots to have him killed, and uses the unknowing R and G to make it happen. Florman, Ben. "Hamlet Act 4, scene 3." LitCharts. LitCharts LLC, 22 Jul 2013. Web. 20 Apr 2019. Florman, Ben. "Hamlet Act 4, scene 3." LitCharts LLC, July 22, 2013. 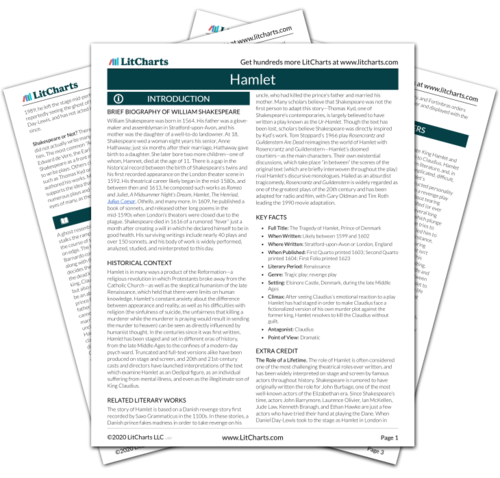 Retrieved April 20, 2019. https://www.litcharts.com/lit/hamlet/act-4-scene-3.